Yesterday had a bit more wind than we originally saw in the forecast. It started of nice in the morning but gusts had to be hitting 20 25 mph by the afternoon. That made for another day of tough fishing. 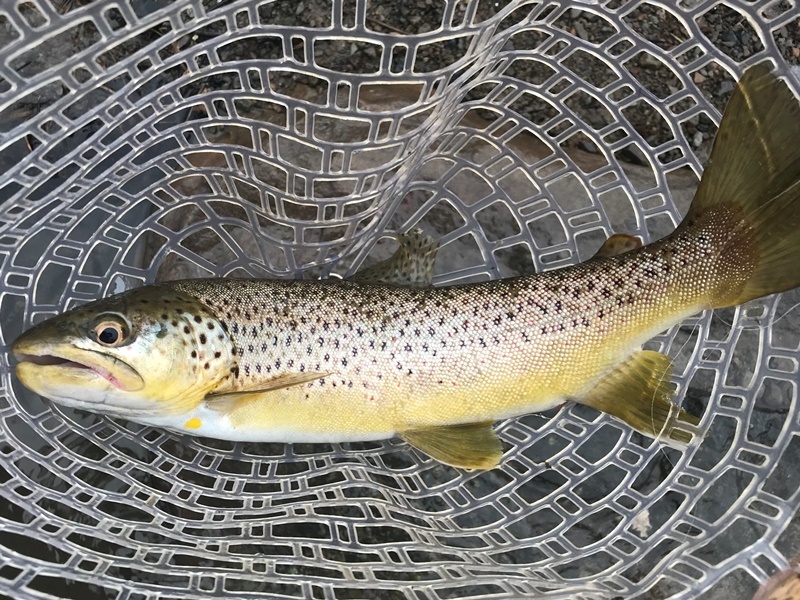 Nymphs and streamers were definitively the best methods to try. We did see some bugs in the air but they were moving by quickly. We’re going to suffer again today with snow turning into rain before we break into a beautiful weekend. We should hit 56 degrees tomorrow and 61 degrees on Sunday. The warmer air temps seem to settle in after today. Keep an eye on the current flows. Cannonsville is at 99% capacity and the inflow in Walton is 1,000 cfs. Yesterday was a pleasant one in between wind gusts. Once the sun popped out and the gusts stopped in the afternoon it felt good to be outside. The forecast has changed slightly and we have a couple more days of cold nights ahead of us before we warm up a bit. It is beautiful out this morning but there will be some strong winds coming through by lunch time. The water temps are up a bit from yesterday morning and should climb throughout the day with the sunshine. 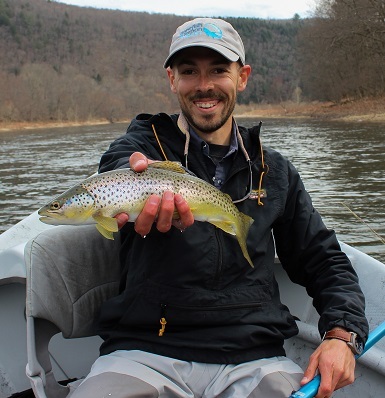 Nymphs and streamers will be your best bets in the wind today. Most of the nymph fish are coming on flies that match the size of the naturals although some people are getting a few on larger nymphs like Pat’s Rubber Leg. Both tightline and indicator nymphing seem to work fine right now. The cold nights and lack of sun over the last two days have dropped the water temps throughout the system. They’ll take a little longer to warm up this afternoon. The flows are dropping slowly as the runoff subsides. We should be dry for the next couple of days with cool nights and warm days but we are on a warming trend. 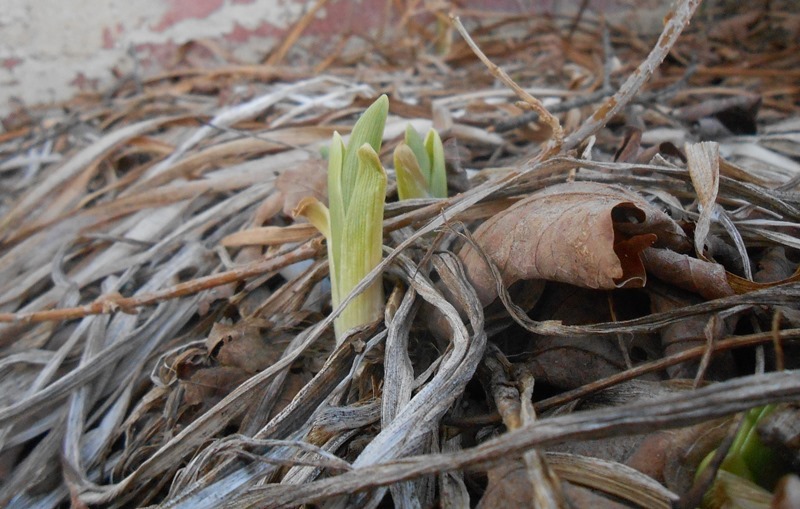 Typical for April. Nymphs and streamers will probably be the most effective methods. Keep switching patterns until you find what the fish are looking for. The wind should peak around 12 mph today. There should be some dry fly shots in the late afternoon in protected areas and in between wind gusts. If you see a fish rise cover it. They can still be a little sporadic this time of year depending on the bugs. Yesterday was chilly and windy. We saw a few snow flakes go by. That made fishing tough but it did pay off for some people. 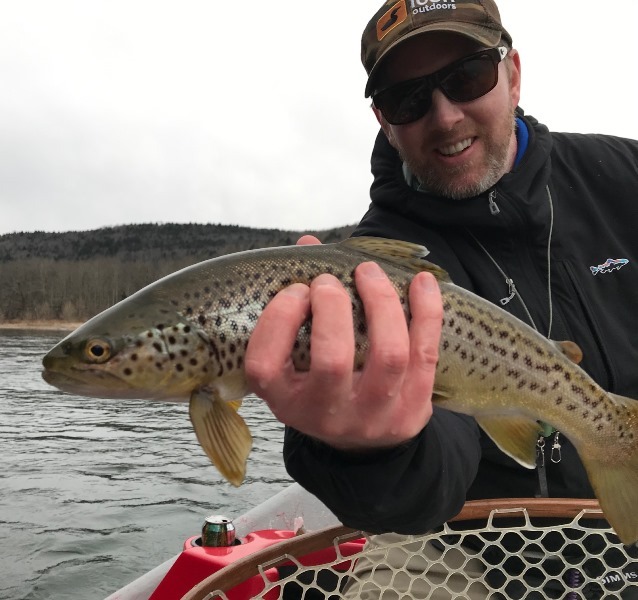 Nymphing was the probably the best strategy for most of the day but the streamer bite picked up in the afternoon. 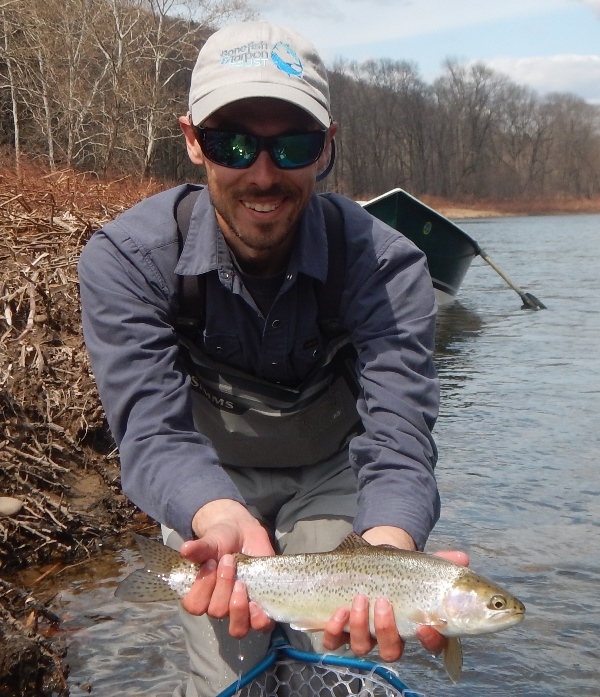 The wind did not help the sporadic dry fly fishing we’ve had over the last few days. Definitely carry your olives and stoneflies. If there is a calm day or a wind break there is a shot at rising fish. We’re coming off a cold night so it will take a while for the water temps to climb today. It looks like a repeat of yesterday with more sunshine. It looks like we have two days left of this cool down and then back to warmer weather beginning Wednesday. The release from Cannonsville has been increased to 600 cfs.We are starting off this season under FFMP Table 4G. There is quite a bit of runoff flowing throughout the system. The next few days look dry so we should see the feeder levels drop. 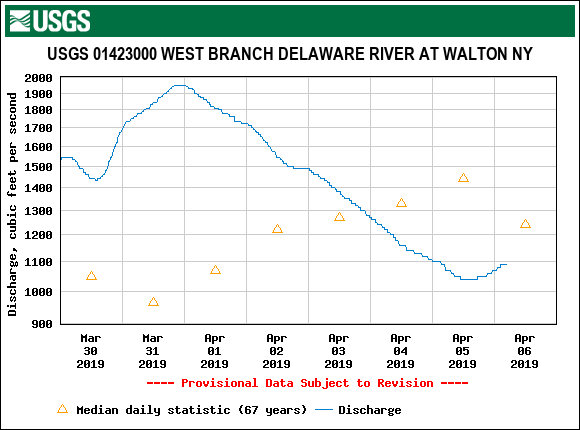 Between the dropping feeder stream flows and the vegetation beginning to drink up some of the ground water we should see the river flows drop slowly throughout the week. 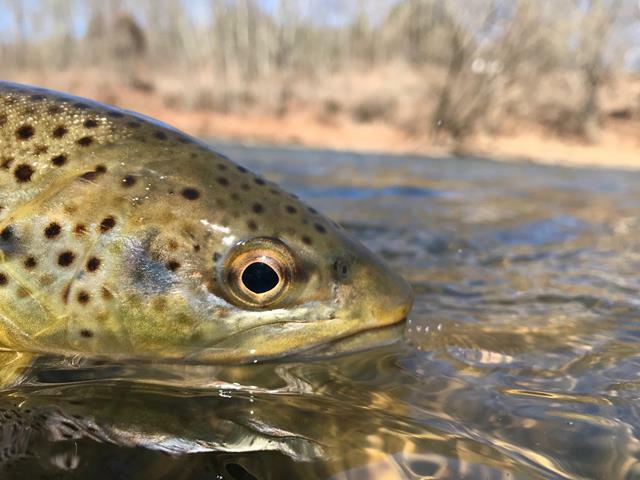 There were legitimate dry fly shots yesterday. The wind made finding consistent fish difficult but the shots were there if you could take advantage of them. Stoneflies and olives made up the bulk of the bugs we saw. Nymphing was definitely the most productive method. The feeder streams were adding some color to the river by mid afternoon and there were some people fishing streamers. We had some rain. The West Branch is a bit high at 944 cfs at Hale Eddy but it looks okay this morning. The Beaverkill and East Branch are sending a lot of water down the Mainstem this morning and the flow at Lordville is over 5,000 cfs. We should see a little more rain this morning. 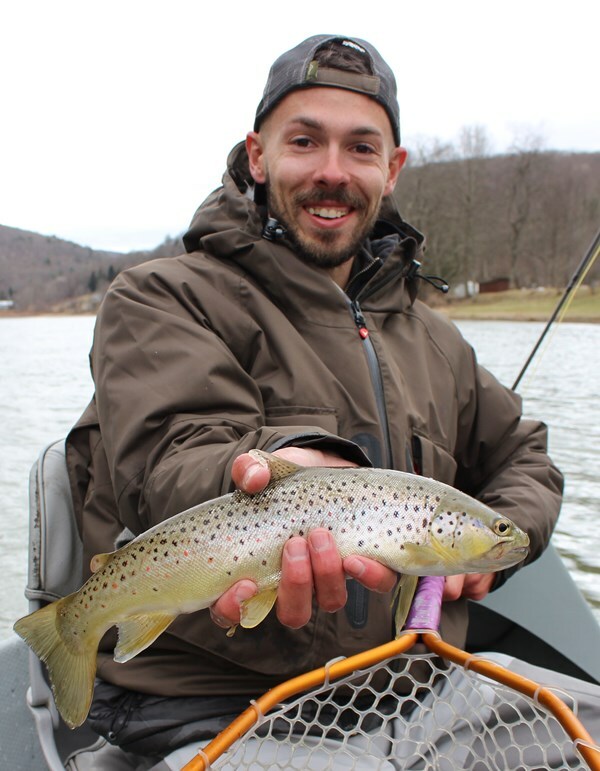 The NYS water is not open yet so fish the border water this weekend. It seems we had a little more rain than was initially in yesterday’s forecast. Most of the river flows climbed slowly throughout the day and didn’t warm up as quickly as we hoped they would. The feeder streams were adding some color by late afternoon. There is still some snow left in the hills adding to the runoff on warm days. That made for tougher fishing and mixed results. Nymphing and streamers are still the best options. Pheasant tails and small stonefly imitations are working well for us. Today looks a little more promising with an air temp high of 65 degrees, cloud cover, and only .15″ of rain. Winds will be 12 – 14 mph from the South. Hopefully Wunderground has today’s forecast correct. The rivers won’t heat up quickly today due to the higher flows and cloud cover. The NYS water is not open yet so fish the border water this weekend. We’re starting off 2019 with a warm weekend, some light rain, and an open Winterdale Road. Feels like a really good start. The release from Cannonsville is just under 200 cfs. The West Branch is in great shape for wading but there is still enough water this morning to float the lower sections. The NYS water is not open yet so stick to the border water this weekend. The low water, sun, and warm air temps have really helped the water temps over the last few days. 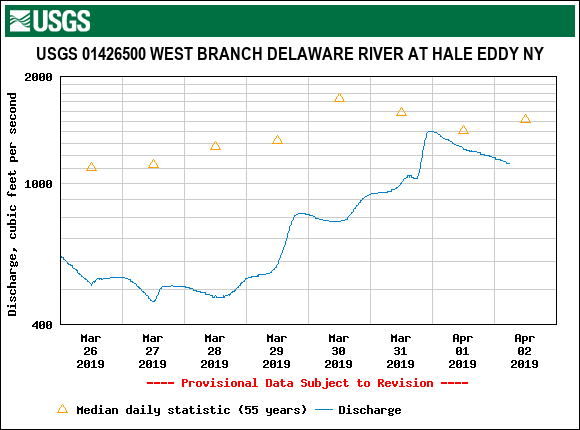 The West Branch at Hale Eddy is peaking in the mid 40’s and starting off at 43 degrees this morning. We’ll see some rain over the next two days but it should only be around 1/4″ each day. Stoneflies and olives have been on the water on warm afternoons so there is a shot at some dry fly fishing. 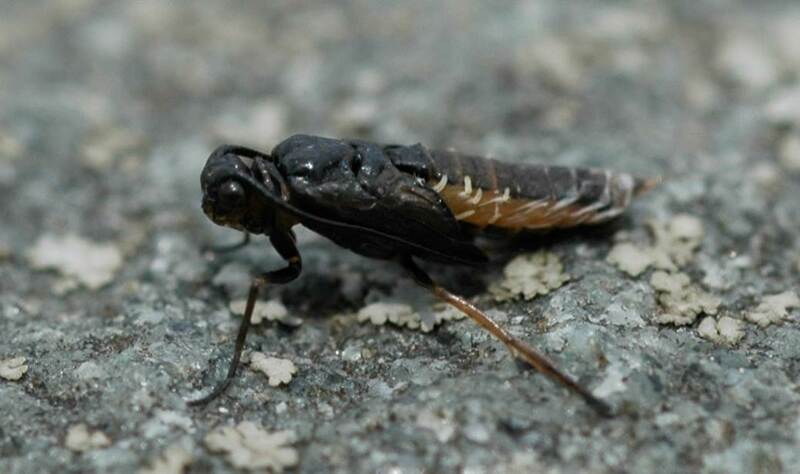 There may be a some little black caddis out there too. Nymphing has definitely been the effective method followed by streamers. Smaller nymphs that match the naturals have worked the best for us. 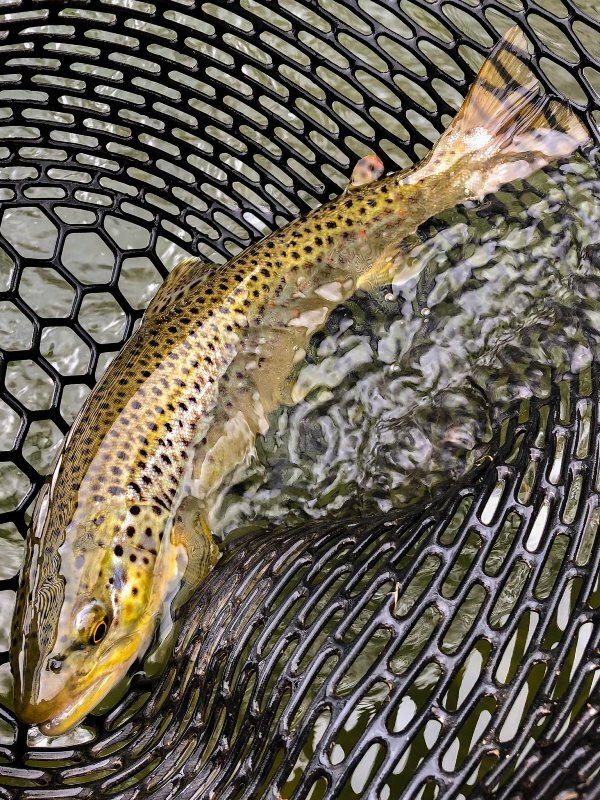 #14 stonefly nymphs and #16 – 18 pheasant tails. The ground is saturated and there are still patches of snow so the river flows will probably bump slightly in the afternoons from the runoff and light rain.